The Team Battle option as shown on the character selection screen in Melee. The current setup shows a 2 vs. 1 vs. 1 team setup, with Players 1 and 2 fighting solo and Players 3 and 4 on a team. Team Battle is a Versus Mode setting present in all games of the Super Smash Bros. series. As the name suggests, players (whether human or CPU) fight alongside others on their team, against the opposing team(s). 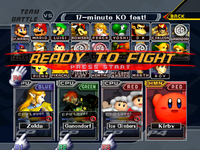 Team Battle can be toggled on and off in the upper left hand corner of the character selection screen by selecting the word "Free-for-all" in Smash 64, or the word "Melee"/"Brawl"/"Smash" in subsequent games. Since team battles are a regular type of Versus Mode, the usual options of Time, Stock, and Coin Battle matches can be selected, along with Special Smash rules as well. In Time and Coin matches, the score (or coins collected) of each team is the combined score of its members and if multiple teams have the same total by the end of the match, then Sudden Death will occur between all members of the tied teams. Stock matches are played in essentially the same manner; each player starts with a set number of lives and the objective is to deplete the stock of the opposing team(s). However, in Team Stock matches there is a feature known as Share Stock where, when one player on a team loses their last stock and has a teammate with two or more stocks, the fallen teammate may borrow one of their teammate's stocks and re-spawn as usual. With the default setting, members of the same team cannot attack each other. However, turning on Friendly Fire on the options screen will allow players to damage their allies. This can lead to techniques such as easily using Mr. Game & Watch's Oil Panic move, giving Kirby a copy ability using Inhale, healing Ness or Lucas with PSI Magnet, or hitting a recovering ally with a low-knockback projectile, allowing them to reuse their up special move after becoming helpless. Team battles are also available when playing With Anyone online. This requires four players, who are randomly split into red and blue teams for a two-minute time match with Friendly Fire disabled. In the first three games, all members of the winning team will perform their victory poses simultaneously. In Smash 4, only one of the characters (the player with the highest score/stock count) will perform a complete victory animation and even then, only one of their animations can ever play, usually being the least special effects heavy (Mewtwo, for example, can only use the victory animation where it turns its head towards the screen after facing away, and can never use its other two). In Ultimate, the members of the winning team go back to performing each of their victory poses simultameously. In Ultimate, players have the option to toggle whether their teammate is translucent or not, so that they can focus more on their battle, not the other teammate. Team Battle flags in Brawl. The final five seconds of a team battle in Super Smash Bros. for Nintendo 3DS on Yoshi's Island. In the original Super Smash Bros., selecting the blue team was the only way to use Samus' or Captain Falcon's Blue color, and selecting the green team was the only way to get Captain Falcon's, Mario's, Kirby's, and Donkey Kong's green color, due to these colors not being available using the C buttons. In 2 vs. 1 or 3 vs. 1 battles, despite there being only one opponent to attack, the Bully, Predator, and Stalker penalties will still be given out to the members of the multi-player team for only attacking a single participant. Because Wario has two sets of outfits, each with its own team setup, he is the only character who has a choice of clothing in team battles prior to SSB4. In the Super Smash Bros. for Nintendo 3DS victory screen, the background will match the color of the winning team. If playing Team Battles in With Anyone, the player can't choose their character until another player has joined. This page was last edited on January 17, 2019, at 03:15.